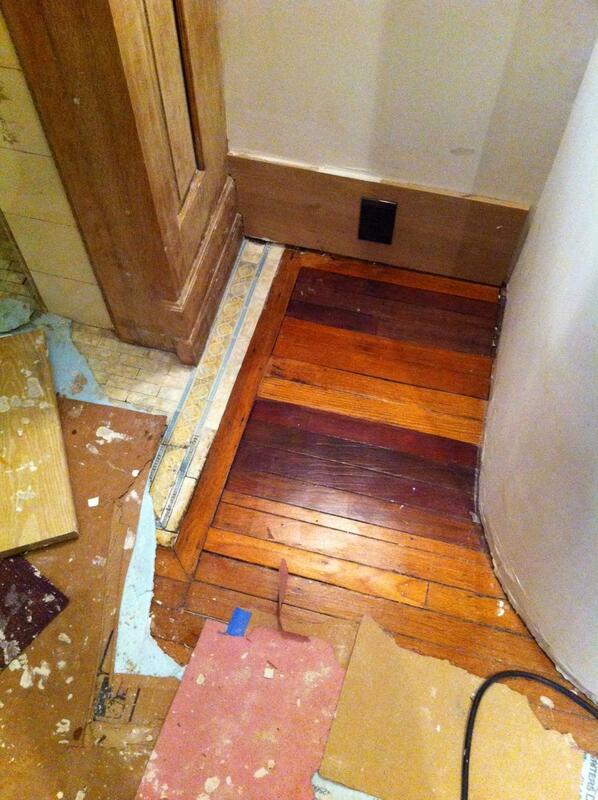 Once we finished up the wood flooring it was time to work on the tile. 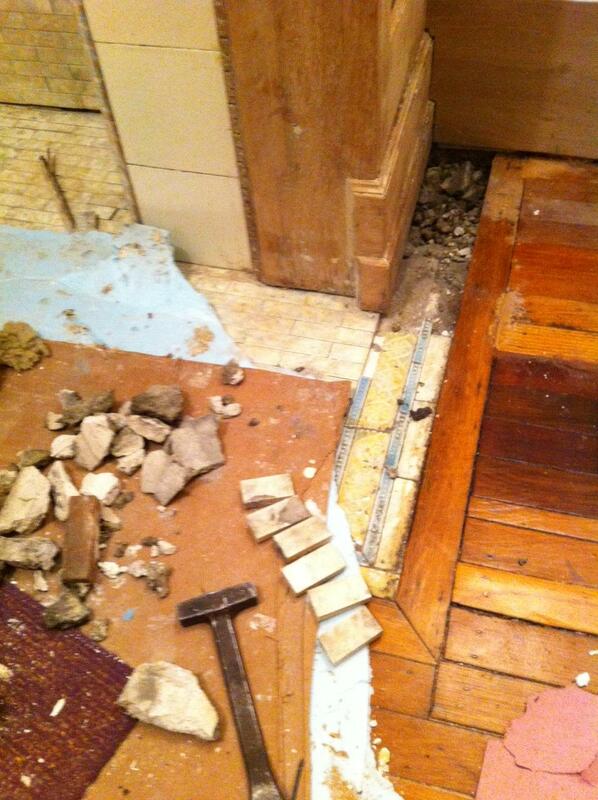 You can see we were missing a few tiles and the rest were loose and cracked. 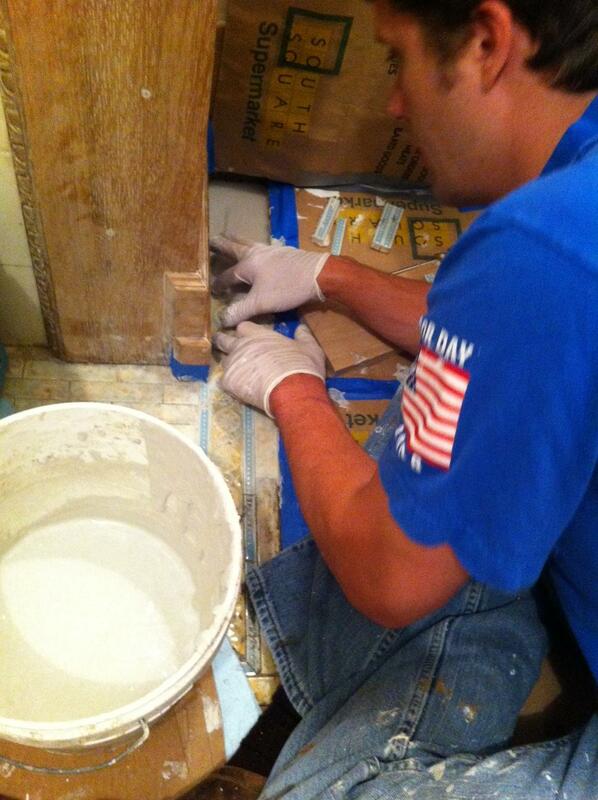 So we carefully removed the old tile and the loose areas of the original mud bed. In the removal process we had a very nice surprise, they had tiled underneath the fireplace woodworking so all of a sudden we have replacement tiles that are a perfect match! They were completely concealed so we don’t need to put them back underneath but will use them to fill in several missing areas. In addition to the find, we also have matching blue border tiles that we salvaged during the 2nd floor bathroom renovation. 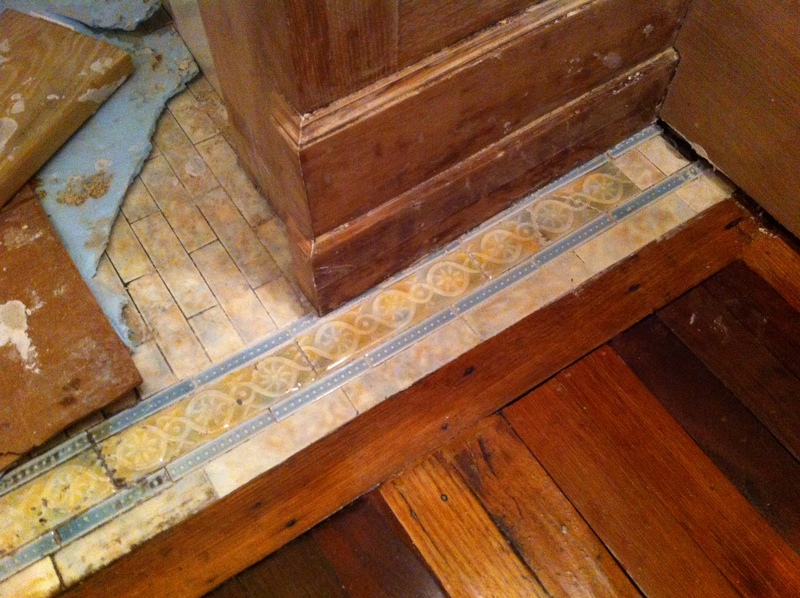 These are very unique, 100 year old tiles and would be almost impossible to match, so we are lucky! Before we started tiling Kelly cleaned the tiles (We thought we would never have had to do this again after the bathroom renovation!). Because the orginal mud bed was so thick we filled it in first and let it dry so we could use a thin set mortar to install the tile. So now it’s time to tile! 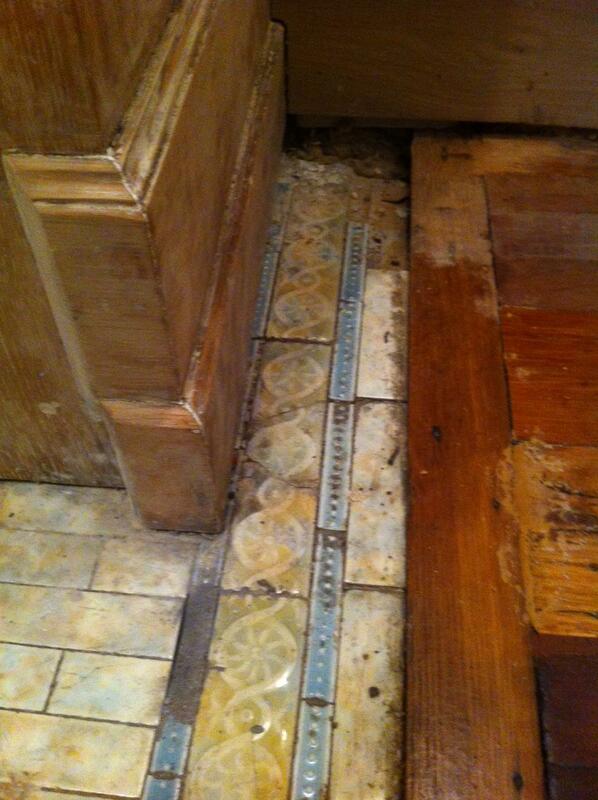 We aligned the top of the tile with the top of floor (It had previously settled) and it all came together well. 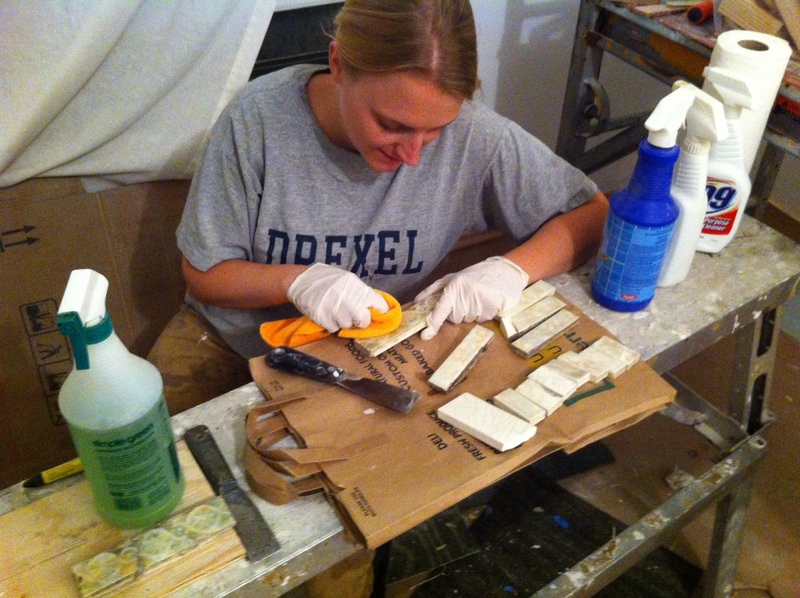 The orginal tile had minuscule joints which we matched so there is not a whole lot to grout. So we now have a perfect corner that is probabley going to look too good when we uncover the rest of the floor! We will at least have to give the rest of the tile a real good cleaning.